The Nunawading & District Lapidary Club Inc had its beginnings in February 1967 when, through the efforts of Les Minter, a small paragraph appeared in the Nunawading Gazette, asking for premises suitable for a Lapidary Club - although the Club hadn't yet been formed! This was followed by a meeting at St Andrews Church Hall, Springfield Road, Nunawading on April 18th 1967 132 people attended, although regrettably there is no record of names of people present. The Club was born at this meeting, with Les Minter as the Founding Father. Under his guidance a Committee was elected, Constitution adopted, fees set and a field trip arranged - all at the inaugural meeting. The Club cutting rooms opened in June 1967 in a rented shop in Raymond Street, North Blackburn, and these rooms served the Club until April 1977 when our own building was officially opened in the Nunawading Reserve. Membership was 85 by August 1967 and it grew so rapidly that, in 1971, the Club was instrumental in forming the Waverley Gem Club so that people in the surrounding areas could be properly catered for. In the period from 1980 to 1990 Club membership remained stable at around 350 members, fitting testimony to the strength of the Club at a time when interest in Lapidary started to decline. In the following 10 years membership has settled back to near the 280 mark, still by far the largest Lapidary Club in Victoria. The first cabochon course was held in June 1969, and the first faceting course in April 1971 following the purchase of 3 "Gemstar" faceting machines for the princely total sum of $450! Cramped conditions at the clubrooms soon saw faceting classes move to the billiard room of one of our members where they stayed until our own clubrooms opened in 1977. Jewellery and silversmithing courses started around 1972 under very primitive conditions, but blossomed after moving to the new rooms. 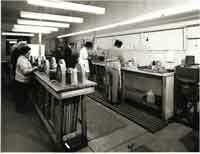 Junior classes for cabbing, enamelling and silversmithing have been a regular feature since 1977. Courses for junior and adult members are running continually, plus occasional courses for members of other Clubs who don't have the necessary facilities. Club records indicate that the incredible number of almost 6000 people have passed through these courses, many of them duplications, doing three of more courses. The Club and its members are indebted to the hard working tutors who have volunteered their services over the years - and still do. The Club's first Exhibition was held in July 1967 at the East Burwood Community Hall (now the Basket Ball stadium). This was quite a feat for a young Club whose original membership included only 4 people who had ever cut a gemstone! Annual Exhibitions were then held at various locations until 1975 when the Nunawading High School Hall became the venue. When the school moved in the mid 90s, the Exhibition moved to the North Blackburn High School. The first cutting competitions were introduced in 1968. 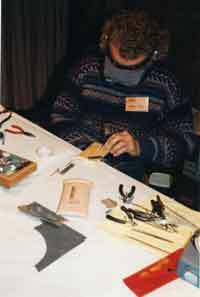 In 1969 Les Minter started the Founder's Trophy for cabochon style cuts competed for over the full year. The Tony Annear Junior Trophy was introduced at the same time. The Club Novice Trophy started in 1977 and 1981 saw the inauguration of the Bill Stansfield Facet Trophy. The Club also ran the Alex Amess and Chas Jewell Faceting competitions for many years, and still runs an Annual Jewellery competition. The Club's magazine GEMFORM was first issued in August 1967 and has been issued to members and many other Australian and overseas Clubs since then. To combat the rising costs of commercial printing, in 1975 the Club leased (and later purchased) offset printing equipment, and it now prints GEMFORM and other Club magazines. The Club's association with community affairs began in April 1968 when it joined the Nunawading Arts Council and remained a member until 1989. Over the years the Club participated in the Nunawading Australia Day Festival, displays at the Civic Centre, Neighbourhood Picnic Days, Whitehorse Festival of Arts, and for some years ran weekly classes at the Vermont Special School. The Club is one of the most active Crafts groups operating in the City of Whitehorse. Members of the Club were instrumental in establishing the Victorian and the Australian Gem Clubs Associations. Part of the reason for the Club's continuing success has been the strength of its administration. The Committee has always been a blend of new and old members, giving the benefit of experience and new ideas. The Club has had 10 Presidents from 1967 to 2000, and six of these are still active members. As at June 2000, the Club has honoured 20 members with Life Membership. The Club's Building Fund started in June 1969 and it received a great boost from a raffle run in 1972 which raised over $3000. At the raffle draw, the then Mayor, Cr David Gawler, announced the Council's offer of the site on which the clubrooms now stand. This was followed by an agonising period of revisions to and (eventually) approval of plans, formation of a Co-operative Society, granting of bank loan, overcoming problems with foundations, and finally the building really started in July 1975. A book could be written on the trials and tribulations endured and overcome during the building period. Suffice to say that while the period of labour was prolonged (Oct '73 to Apr '77) the birth was well worth the effort. It all couldn't have happened without the efforts of Frank Holmes - Honorary Architect and Building Supervisor who, while he may have been tempted to chuck it in many time during the frustrating gestation period, stuck to his guns and ensured the job was completed. The excellent facilities at the new clubrooms resulted in greater member participation (ie, overcrowding), and in April 1984 work commenced on extending the rooms to provide a larger meeting room, enlarged air conditioned faceting room and a store room. This was entirely financed from Club funds at a cost exceeding $15,000. The extended rooms were useable by July 1984 and finishing touches were progressively added over the next year or so, as funds became available. Of necessity, many names have been omitted from this brief history. Perhaps this is appropriate because the Club has prospered, not through individuals, but through the efforts of its members working together as a Club. However, and much and all as he would dislike it, tribute must be paid to Les Minter Club Founder and the father of Victorian Lapidary. Field trip during Tasmanian Gemboree to mt Colebrook mine. Field trip to Flinders 1991. Field trip to Walkerville 1988. Jewellery demonstration at the club annual exhibition.